Are you ready to continue with this holiday table runner? I know that I am. 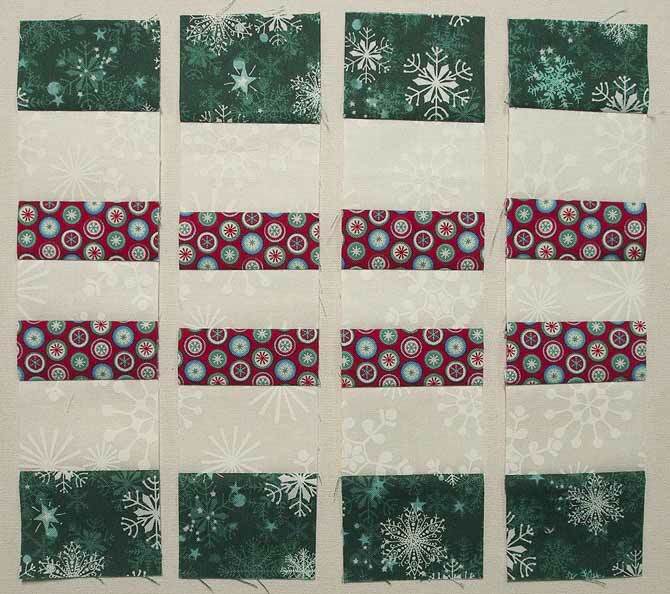 Today, we’re going to make easy quilt blocks with strip piecing. Strip piecing is a very fast and efficient way to sew multiple strips of different fabrics together to create blocks, sashing or borders. First of all, you’ll need to cut some strips. 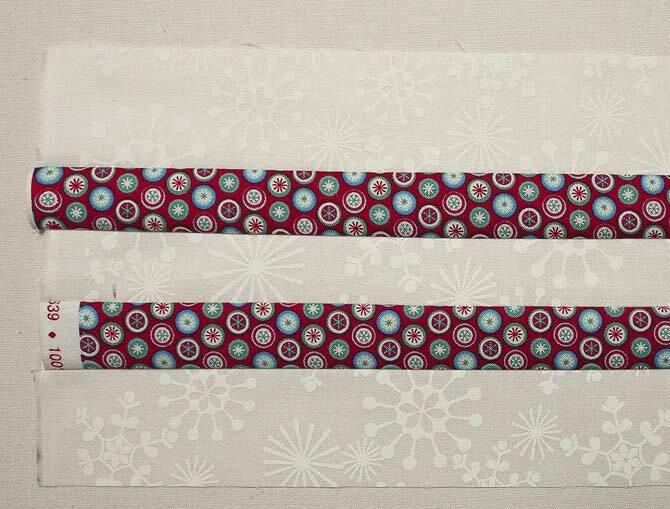 Lay out the strips on the table in the order they are to be sewn starting with the 2″ background, 1½″ feature fabric, 1½″ back ground, 1½″ feature fabric and finally the last 2″ background. 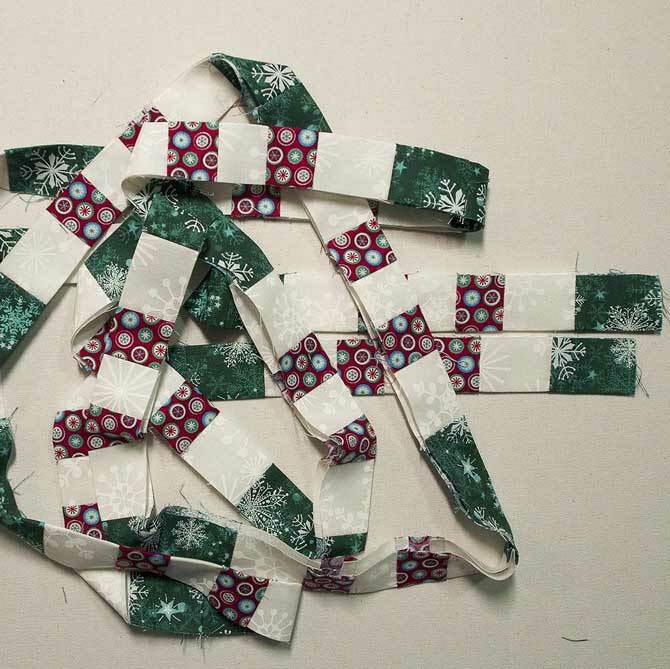 Sew the strips together to create a strip set. You may want to sew each seam in the opposite direction to help keep everything square. This is done by starting at the top of the strip and sewing to the bottom. When the next strip is put on, start at the bottom of the strip and sew towards the top. Keep alternating until the strips are all sewn together. Having the IDT system engaged on the Pfaff Ambition 1.0 makes for nice even feed and straight seams. Press the seam to the dark feature fabric for this piece since the other strips are white. Some hints when pressing are to use a dry iron to prevent any warping or misshaping of fabric. Steam causes cotton to change shape very quickly. Another good tip when pressing WOF strips is to set the seam (which means to iron the seam the full length before moving to the next step). Then, press the seam to one side from the middle of the strip to one end, go back to the middle again and press to the other end. This will ensure the strip stays square and straight with no wavy bits in the seam. 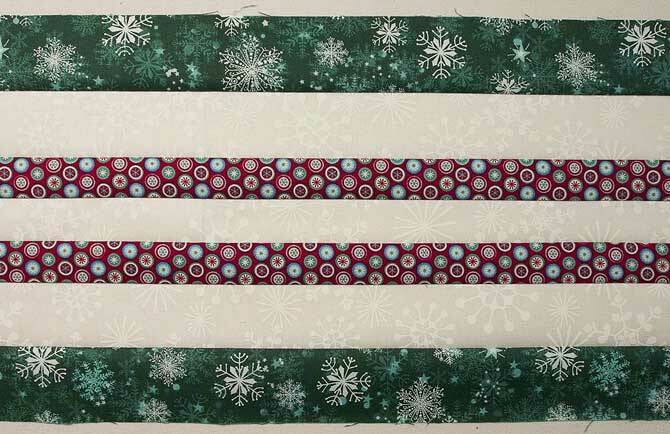 I decided that I didn’t like just the white and red so I added in a green strip on either side of the strip set. The green strips were cut at 2″ x WOF. This fabric is different from the green in the star. The strip set will be 9″ x WOF. 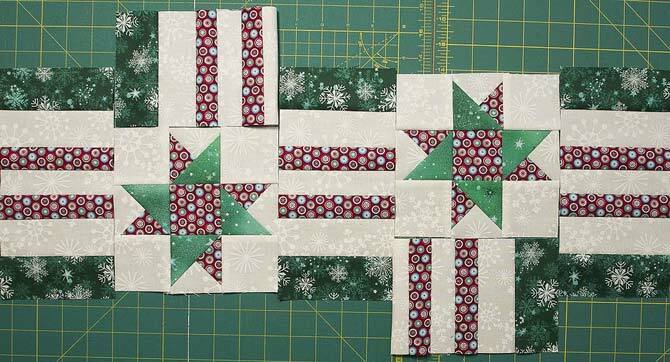 Now that the strip set is done, you can square it off and cut the blocks out of the strip set. 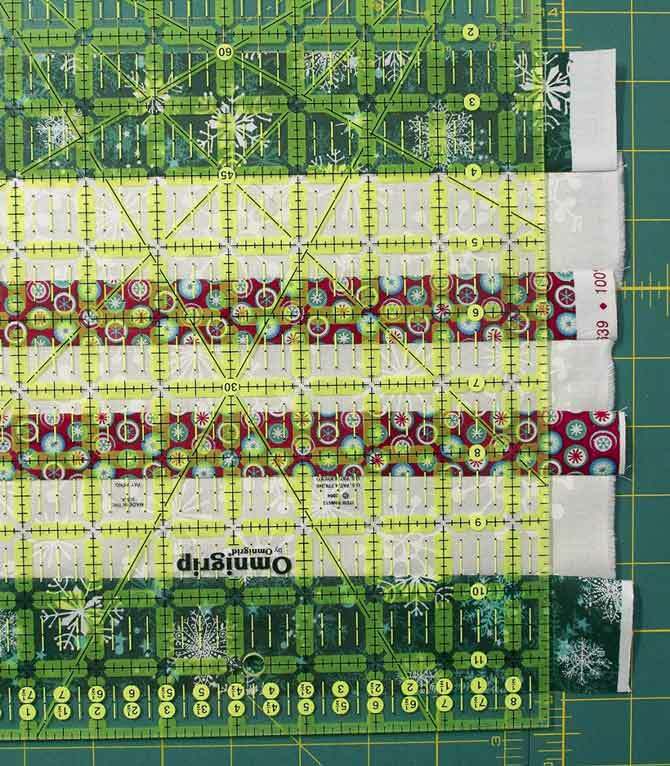 To square off a strip set, line up the ruler at one end on the seam line – you can see where the 4 inch line is lined up on the green and white seam in the photo below – and trim off the excess selvage ends. Strip sets are never even on the ends as fabric is never the same width – it can range from 40″ – 44″ with the average being 42″. Cut the blocks from the squared off end of the strip set. Cut 8 – 4 ½″ x 9″ blocks which are rectangles. My plan was to lay out the stars so that the feature fabric from the strip set looked like it was running through them and the stars were staggered as in the following picture. In reality it didn’t look as good as I imagined, and so I tried another layout like the one below. I was not happy with this one either and so I decided to repurpose these easy quilt blocks elsewhere. The blocks were cut at 4½″ wide and my binding is cut at 2¼″ wide strips so I thought…why not cut each block in half? Sew all the pieces end to end. Finally, you’ll end up with a pieced binding pressed in half with wrong sides together all ready for the final phase of the quilt. I’m not quite there yet, so will set it aside for now. Using strip piecing to create easy quilt blocks, resulted in a very interesting binding for this quilt. The center of the quilt, however, is still lacking a plan. I guess I’ll be back at the design wall tomorrow – creating.